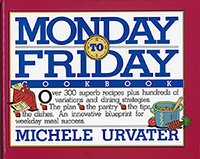 I first found the Monday to Friday Cookbook at the library. After several recipe successes, I bought one of my own. The book's idea is easy preparation of meals during the week. Note that this doesn't always mean that the recipes are quick to prepare. Still, the sections on organizing the pantry are useful, the general tips for various kinds of foods practical, and the volume contains some stellar recipes. Like this one. Fennel and tarragon seems like an unlikely combination. Oddly, the tomatoes make them compliment each other perfectly. The original recipe calls for fresh tomatoes. You can substitute fire-roasted canned and reduce the amount of added salt. I've also substituted cilantro for the parsley, but in this case I eliminated the tarragon, erring on the side of caution. I also use much of the feathery tops when I make any variation of this dish. I’ve adapted this recipe numerous ways, so feel free to get creative with it. Trim and discard the feathery tips from the fennel. Cut each bulb in half from top to bottom and cut out triangular core. Slice each half crosswise, about ½” thick. Cut each tomato in half and remove seeds with spoon. Finely chop flesh. Mince parsley. Heat the oil in a large skillet over medium heat until sizzling. Add fennel and tomatoes, sauté for a minute to coat with oil. Add tarragon, broth, and salt and pepper to taste. Cover and simmer till fennel is tender, about 20 minutes. Remove lid from skillet. Add parsley. If there’s too much liquid, boil over medium-high till most of it evaporates. Adjust seasonings and serve hot. The fennel was very young, so didn’t remove core. I used much of the feathery tops. I substituted 1 Tbsp olive oil for the 2 Tbsp vegetable oil. 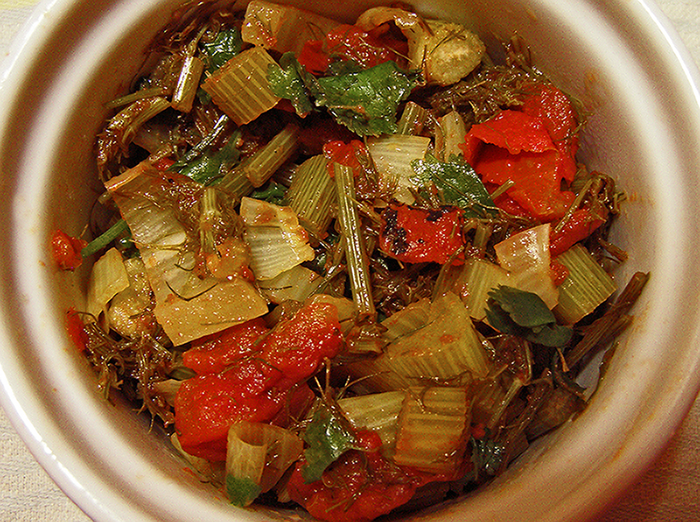 Olive oil complements both fennel and tomatoes. I used an electric frying pan at 250 – 275 degrees instead of a skillet. I substituted cilantro for parsley, and eliminated the tarragon. I kept the leaves whole rather than mincing, and added it at the very end after boiling off liquid (which takes about 5 minutes) to preserve its flavor. I substituted a 14.5 oz can of fire-roasted tomatoes for the fresh tomatoes, and added the tomatoes after I’d coated the fennel with oil. This recipe works equally well with canned or fresh tomatoes, and proportion of fennel to tomato can be varied quite a bit.